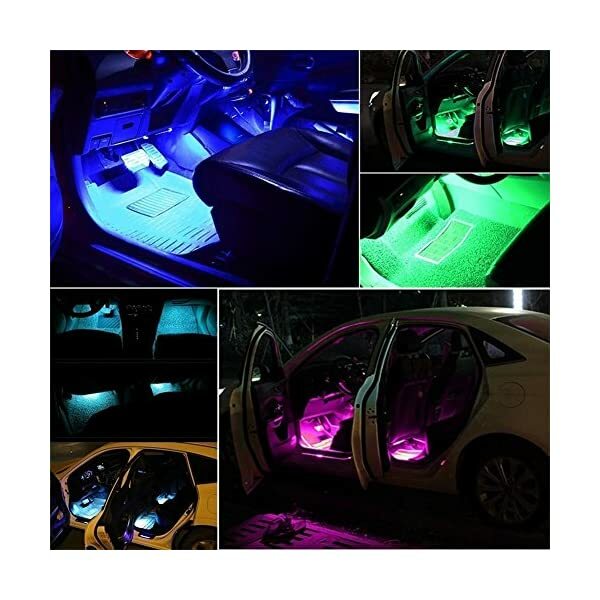 ★ Wireless music control 8 color RGB car interior footwell lights kits. 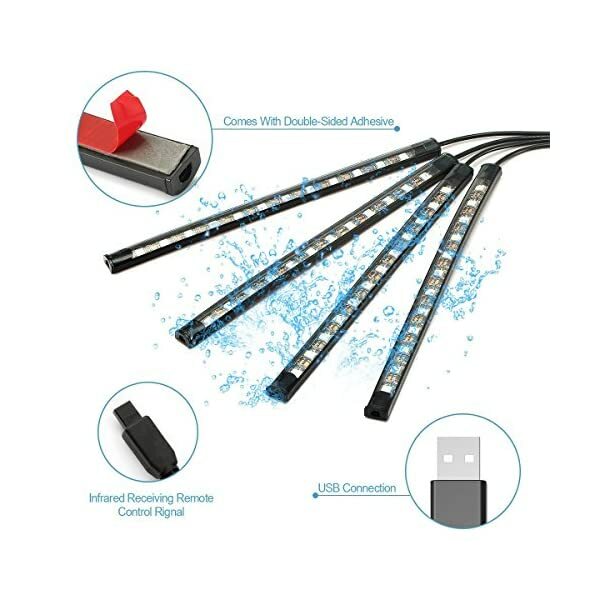 LED: 4x 12leds, LED type: 5050-SMD, LED Light Length: 9″; Width: 0.5″, Strip light Cable Length:2*48″ + 2*60″, Car USB Charger Cable Length: 40″, Extend Wire Length: 12″. 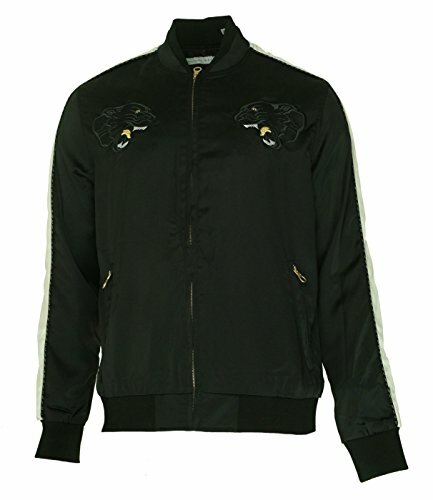 pls notice that: 1. 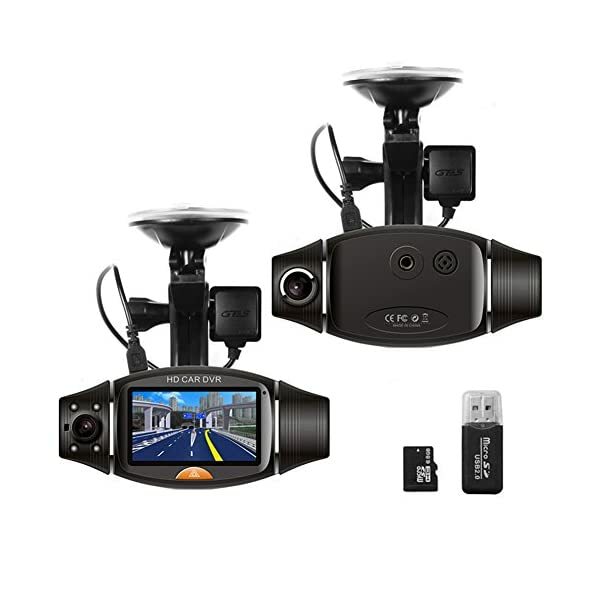 The remote control should point directly to the black receiver box and there is no obstacle between them; 2. 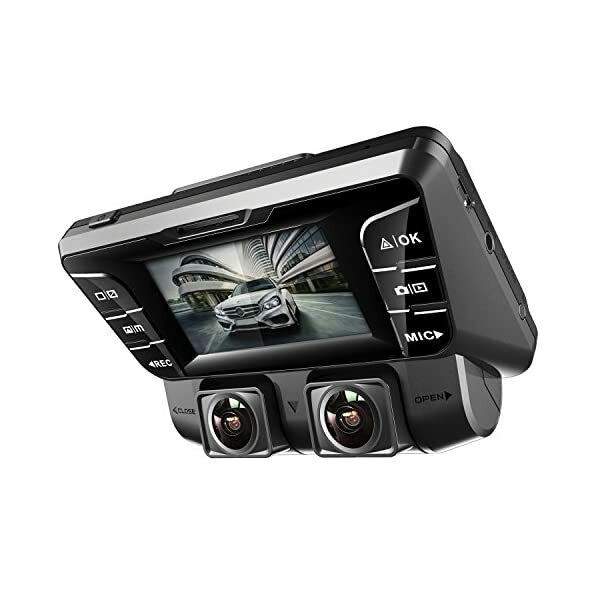 The remote should be put near to the receiver box, not too far. 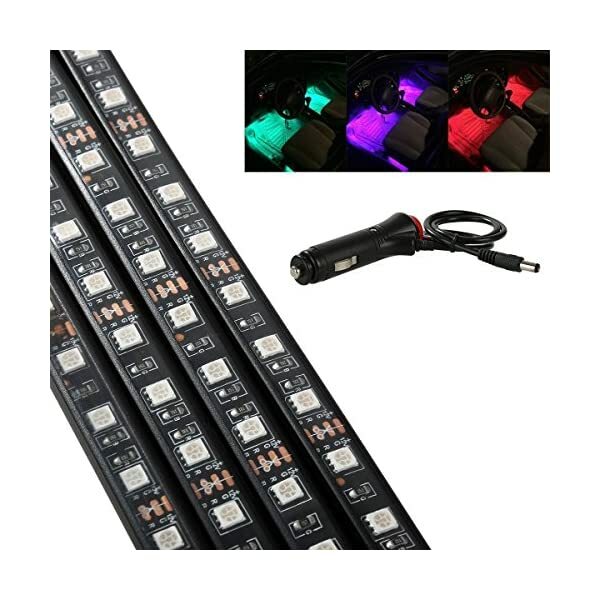 ★FEATURE: High quality RGB LED strip lights, waterproof, anti-collision, anti-corrosion. 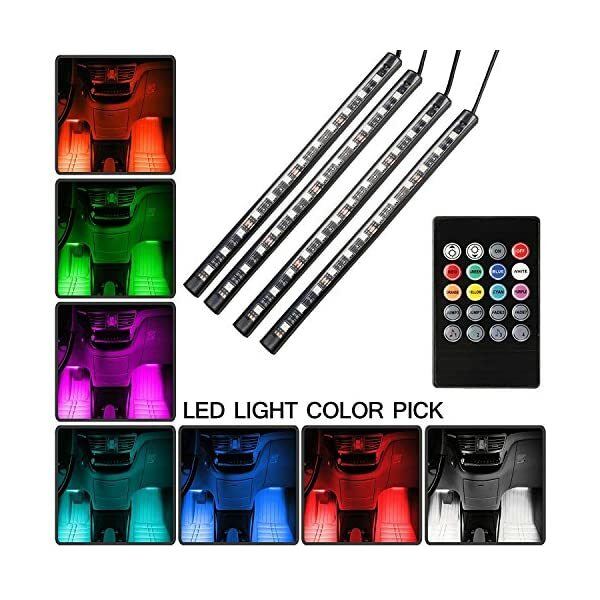 YougIka Wireless IR control, change the color as you wish. 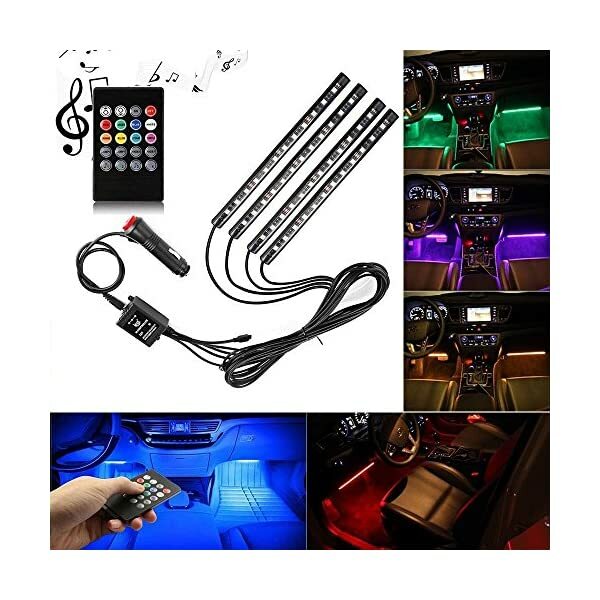 Also sound-activated allows you enjoy the fun with the color changing following your car stereo music rhythm as well as your voice. 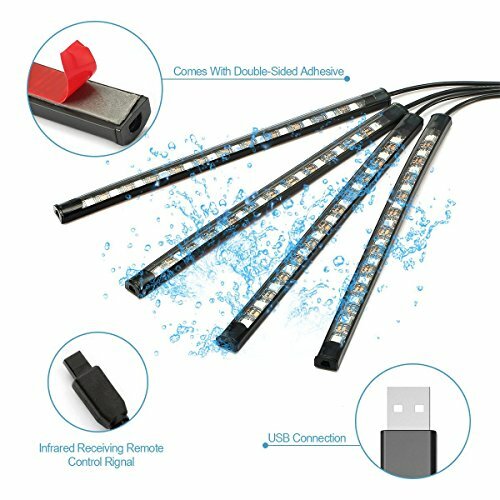 Waterproof IP68. 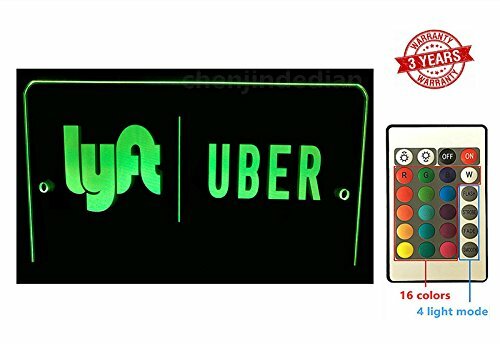 ★FUNCTION: 8-signal color control, brightness control, ON/OFF, 2 jump mode control: Color changing; Flashing & Fade, 2 fade mode control: adjust luminance; Strobe & Smooth. 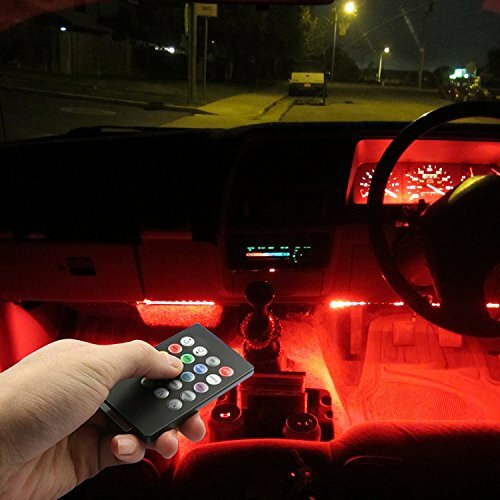 To make sure the remote control work, you need to point the control directly to the receiver. 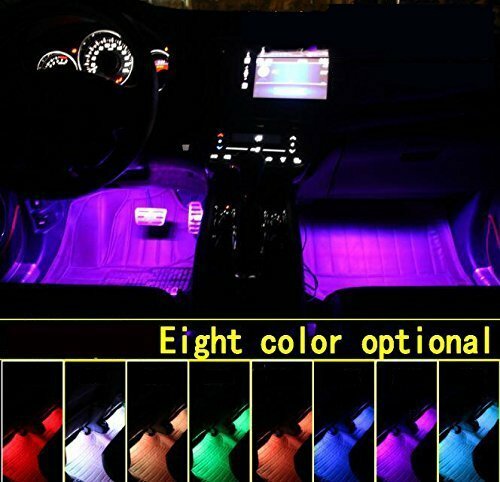 Wireless music control 8 color RGB car interior footwell lights kits. 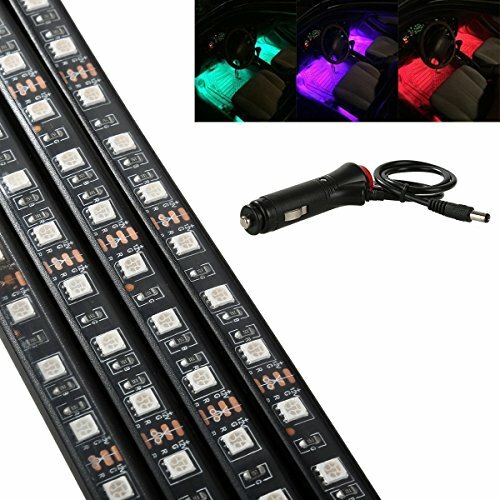 High quality RGB LED strip lights, waterproof, anti-collision, anti-corrosion,Wireless IR control, change the color as you wish. 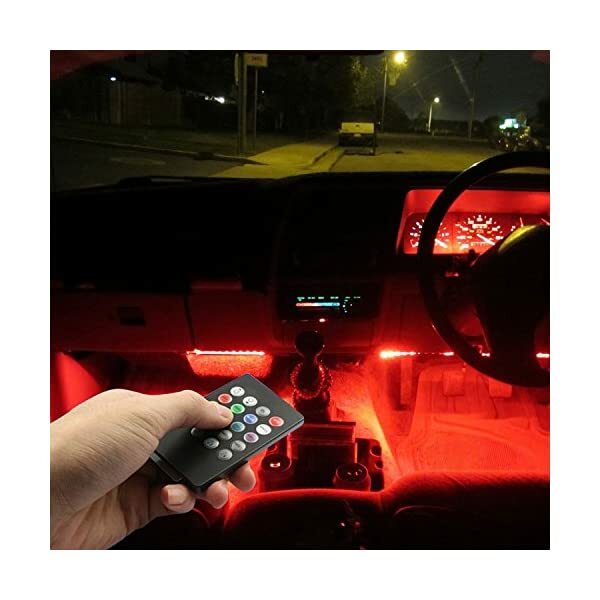 To make sure the remote control work, you need to point the control directly to the receiver. 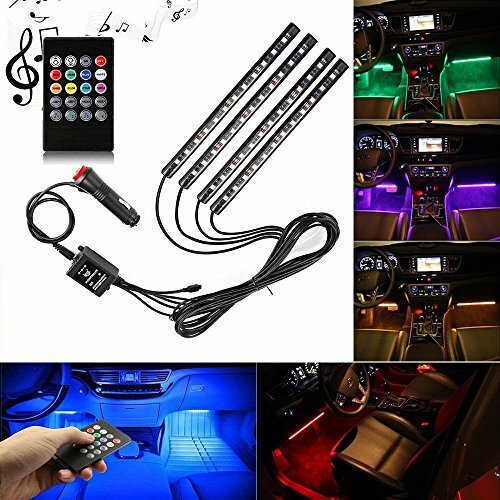 An easy way to install it in your car, no need to modify the wiring,simply peel off the 3M double-sided tape behind each strip and apply the LED strips under the seats or in the footwell area. 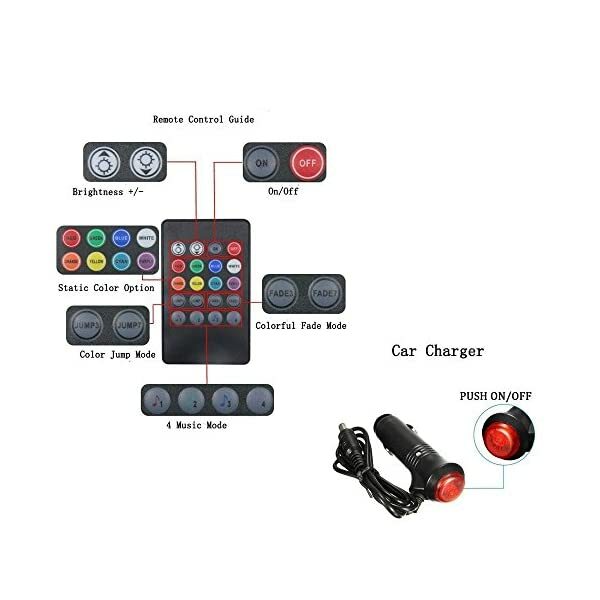 Including one car charger,dual smart USB ports,featuring of DC 12V (10-15V); Output: DC 5V 2.4A. 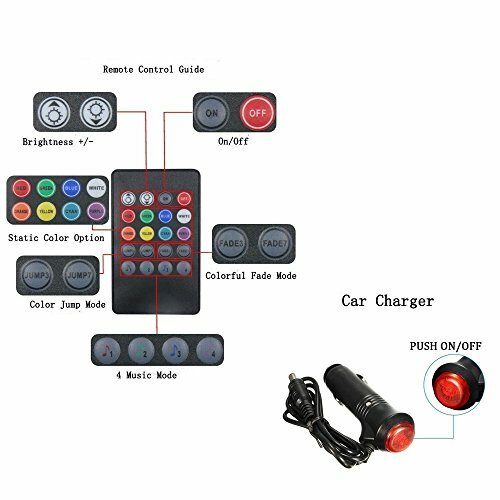 USB powered, universal fit all Car Model, Personal Computer. 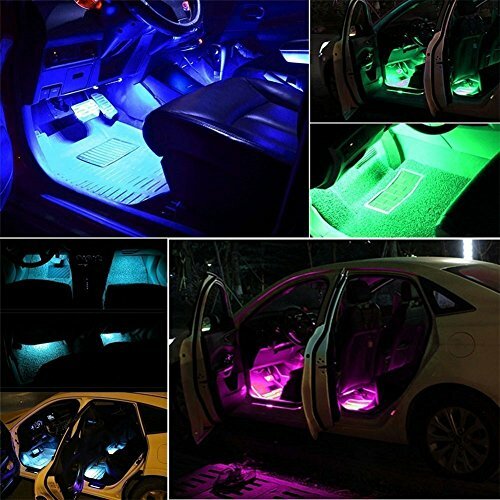 ★INSTALLATION: An easy way to install it in your car, no need to modify the wiring,simply peel off the double-sided tape behind each strip and apply the LED strips under the seats or in the footwell area.Simple design for you to decorate your car a beautiful, exotic and romantic interior. 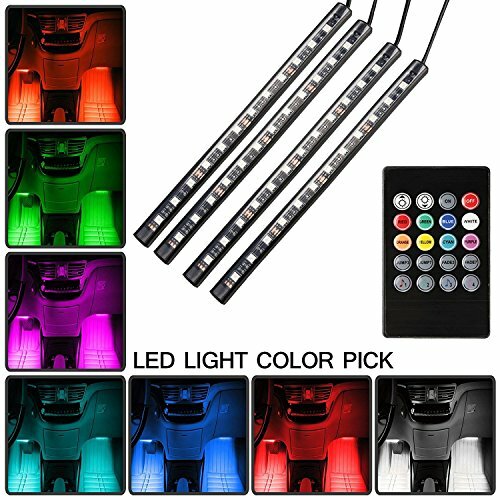 ★EASY TO INSTALL & Use: Double-sided adhesive straps, directly inserted in cigarette lighter, without modification,enjoy a nice light wherever you are.